Cochiti Street Road - Red Plains Professional, Inc. 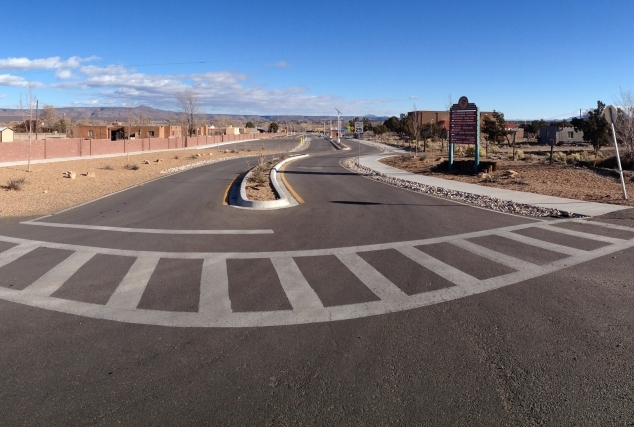 This project included several components from community planning, roadway conceptual design, parking lot analysis, and the final design of Cochiti Street and the parking facilities which provide access to the Tribal Headquarters, Hahn Center, Community Center, Clinic, and many other culturally significant locations in the heart of the Pueblo. The conceptual planning phase included several public meetings in which Red Plains presented six unique, conceptually designed streetscapes. The Cochiti Design Committee, public, and Tribal Council all were involved in this process. We provided the technical traffic modeling, parking lot analysis, landscape design options, traffic volume analysis, trip generation analysis, and community beautification study allowing the Tribe to analyze the options and make an educated and well thought out design decision. The project realigned the roadway to provide off-street parking, landscaped medians, and traffic calming features. The roadway also incorporates a traffic roundabout for public transit bus access, and a bus stop pull out lane. The design considers future road connections and adjacent building development. RPP saw the project through from planning to Construction Management.